My daughter has allergies, allergic to almost everything. Also friends are amazed how well it works, even though they never heard of AirMaxx by Nutritional Frontiers. Has dealing with allergies taken a toll on you? Sometimes the discomfort of allergy related symptoms can be unpleasant. 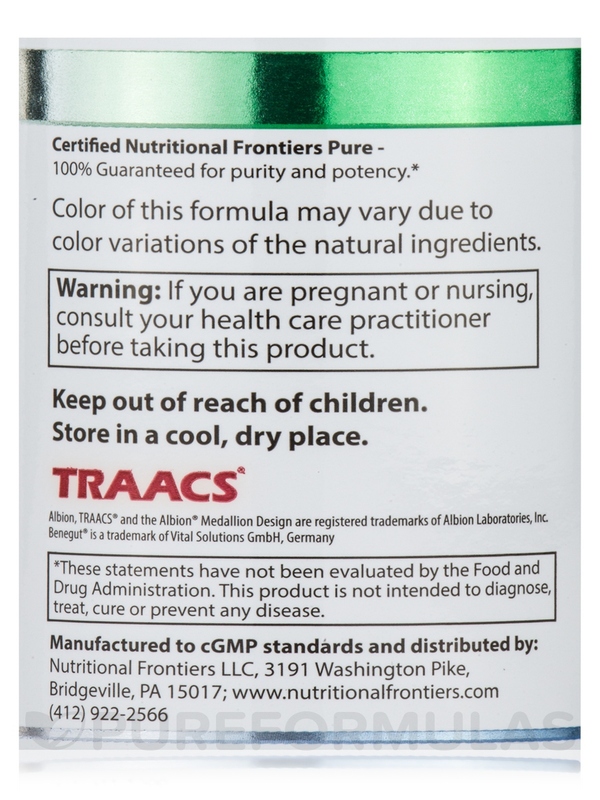 AirMaxx by Nutritional Frontiers offers key ingredients that may help maintain histamine levels‚ which an imbalance in may cause certain allergy symptoms‚ i.e. itchy eyes‚ irritated skin‚ and more. 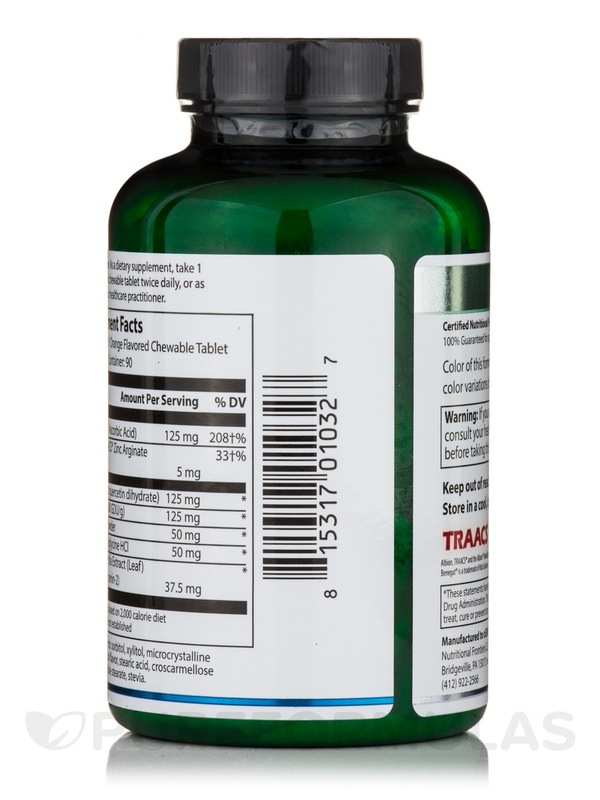 In addition‚ this supplement may help support a healthy immune system and good respiratory function. 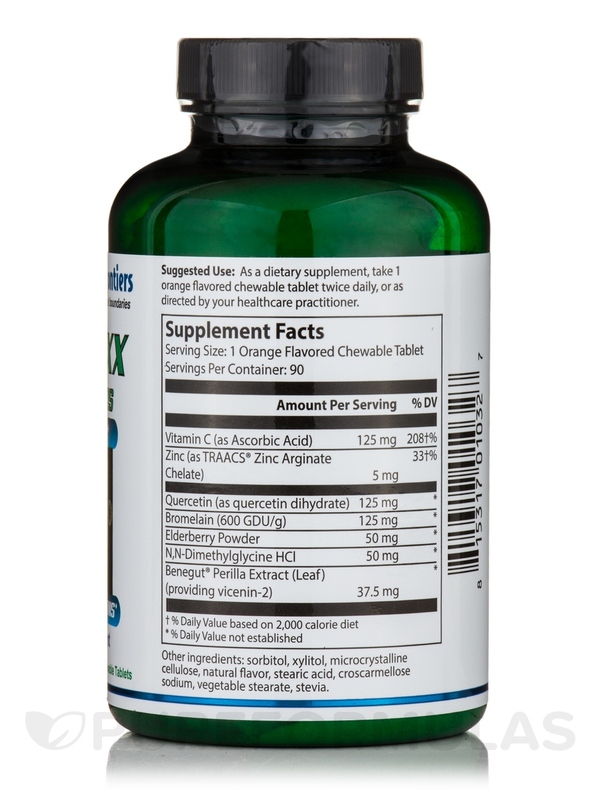 Some of the main ingredients in these chewable tablets include vitamin C‚ bromelain‚ and quercetin. These all work together to provide the health benefits that AirMaxx offers. Vitamin C is an essential nutrient believed to help support the immune system. Bromelain is an enzyme that may reduce swelling of the sinuses. Quercetin is a flavonoid (plant pigment) believed to help ease allergic reactions by supporting your histamine levels. 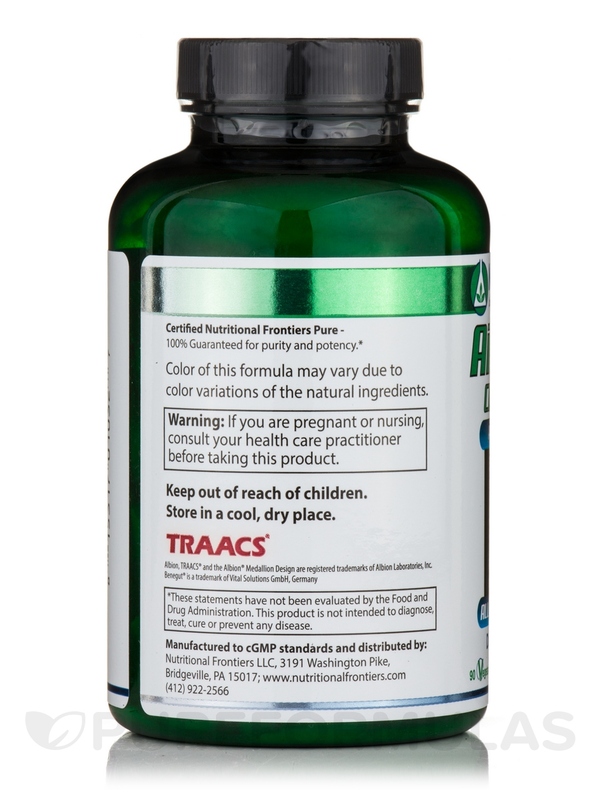 AirMaxx is a vegetarian formula that is free of gluten and dairy—common food allergens. Please consult with your physician before taking this supplement. Other Ingredients: Sorbitol‚ xylitol‚ microcrystalline cellulose‚ natural flavor‚ stearic acid‚ croscarmellose sodium‚ vegetable stearate‚ stevia. 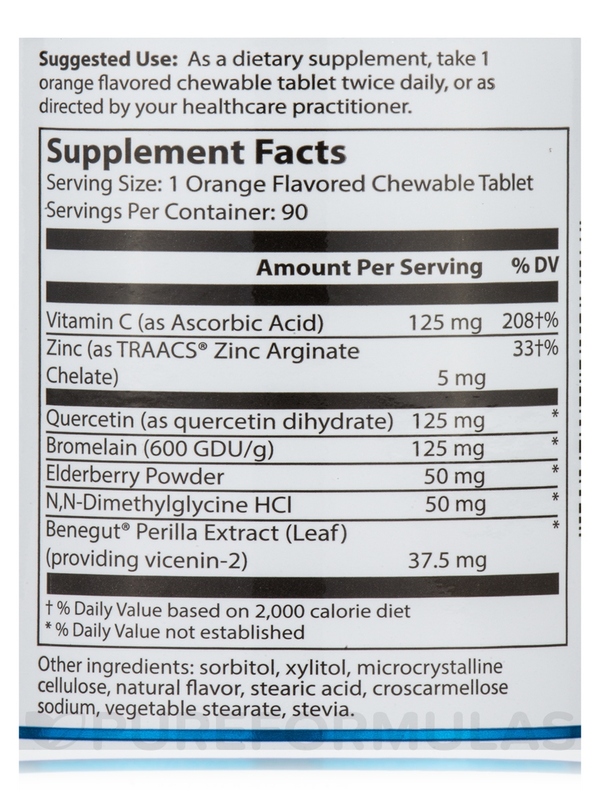 As a dietary supplement‚ take 1 orange flavored chewable tablet twice daily‚ or as directed by your healthcare practitioner. I've been using AirMaxx by Nutritional Frontiers for the past 2 years and it makes a huge difference in my allergies. I love everything about this product except that it is hard to chew. I feel like I might break a tooth. Seems like the tablets are harder this year than the batch I used last year. Please soften these up a bit so we don't hurt our teeth. Works great for my allergies. The tablets seem harder this year, and I'm afraid I'll break a tooth. I even cut them in quarters and they are still hard to make that first break. I guess I could crush them, but I'd prefer they just go back to the same formula as last year. Air maxx for allergies /asthma. I used Air Maxx by Nutritional Frontiers for two reasons: seasonal allergies and asthma. I rarely have both at the same time. I used several other products with no relief. After taking first dose of air maxx, I was breathing normal within an hour. I was able to cough up phlegm that was causing huge problems for me. It is very good tasting as well. Tastes good and is very effective. 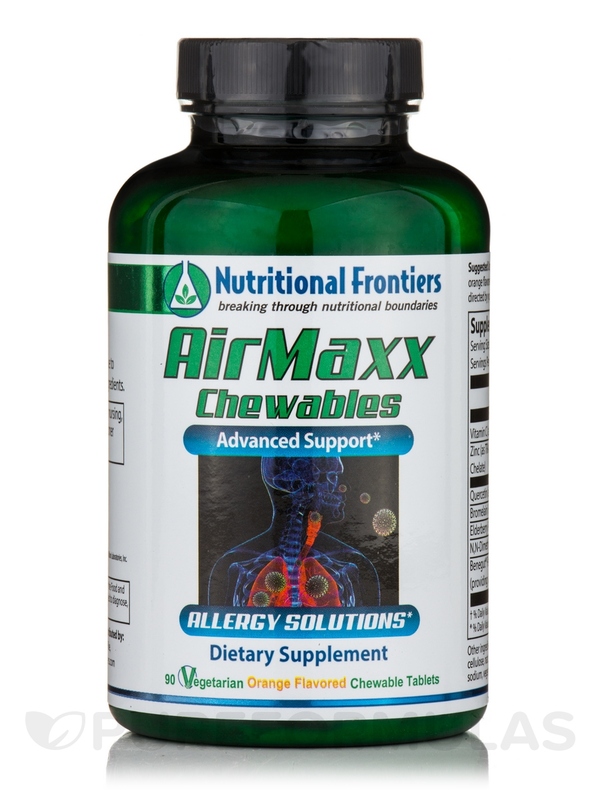 AirMaxx by Nutritional Frontiers was recommended to us by my wife's nutritionist to help with allergy symptoms. Since I have a more severe case this year I've had a hard time knowing if there's anyone product that has made a huge differences, but this has certainly provided some relief. It provides quick relief to my children's itchy eyes and scratchy throats! Unfortunately since it appears we are dealing with at least touches of allergies every year, we will be keeping AirMaxx around! I'd rather not have to deal with it at all, but it's nice to know there's natural products that work and provide a safe alternatives to meds! I like that the chewable tablet is palatable! AirMaxx is an excellent product. I have chronic allergy related sinus problems in the Spring. I just finished my first bottle of these going through an especially damp Spring and have only had to take a couple allergy pills when I have been spending the day mucking around doing remodeling in the basement. Thanks Dr. Tennpenny for the recommendation! I usually use AirMaxx when I feel a cold coming on or in this last case when I had a cold. The symptoms seem to go away faster.